The emperor, after making enquiries about Islam, gave general approval to the new religion which he considered to be compatible with the teachings of Confucius. But he felt that the five daily canonical prayers and a month of fasting were requirements too severe for his taste and he did not convert. He allowed Sad Ibn Abi Waqqas and his delegation freedom to propagate their faith and expressed his admiration for Islam which consequently gained a firm foothold in the country. 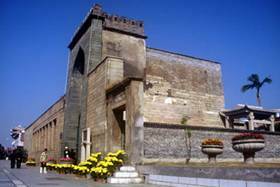 Sad later settled in Guangzhou and built the Huaisheng Mosque which was an important event in the history of Islam in China. It is reputedly the oldest surviving mosque in the whole of China and is over 1300 years old. 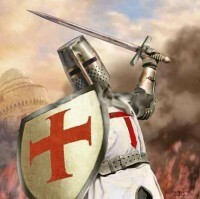 It survived through several historical events which inevitably took place outside its door step. This mosque still stands in excellent condition in modern Guangzhou after repairs and restorations. Its contemporary Da Qingzhen Si (Great Mosque) of Chang’an (present day Xi’an) in Shaanxi Province was founded in c.742 CE. It is the largest (12,000 sq metres) and the best early mosque in China and it has been beautifully preserved as it expanded over the centuries. The present layout was constructed by the Ming Dynasty in c.1392 CE, a century before the fall of Granada, under its (ostensible) founder Hajj Zheng He who has a stone tablet at the mosque in commemoration of his generous support, which was provided by the grateful Emperor. A fine model of the Great Mosque with all its surrounding walls and the magnificent, elegant appearance of its pavilions and courtyards can be seen at the Hong Kong Museum placed gracefully besides the model of the Huaisheng Mosque. I was fortunate to visit the real mosque last year during Asr prayer, after which I met the Imam who showed me an old handwritten Quran and presented me with a white cap. Walking to the prayer hall is like sleepwalking through an oriental oasis confined in a city forbidden for the impure. A dragon symbol is engraved at the footstep of the entrance opposite the prayer hall demonstrating the meeting between Islam and the Chinese civilisation. All in all it is a dazzling encounter of the architecture of Oriental China with that of the indigenous fashionable taste of Harun ar-Rashid (147-194 AH/764-809 CE) of Baghdad – a newly founded city that was to become the greatest between Constantinople and China, fifty years after the time of Harun. The Sheng-You Si (Mosque of the Holy Friend), also known as the Qingjing Si (Mosque of Purity) and Al-Sahabah Mosque (Mosque of Companions), was built with pure granite in 1009 CE during the Northern Song Dynasty (960-1127). Its architectural design and style was modeled on the Great Mosque of Damascus (709-15) in Syria thus making the pair the oldest extant Mosques to survive (in original form) into the twenty-first century. Qingjing Mosque is located at “Madinat al-Zaytun” (Quanzhou) or, in English, “City of Olives” in Fujian Province, where also two Companions of the Prophet who accompanied Sa’d Ibn Abi Waqqas’s envoy to China are buried. They are known to the locals by their Chinese names of “Sa-Ke-Zu and Wu-Ku-Su”. Zhen-Jiao Si (Mosque of the True Religion), also known as Feng-Huang Si (the Phoenix Mosque) in Hangzhou, Zhejiang Province, is believed to date back from the Tang Dynasty. It has a multi-storied portal, serving as a minaret and a platform for observing the moon. The Mosque has a long history and it has been rebuilt and renovated on a number of occasions over the centuries. It is much smaller than it used to be, especially with the widening of the road in 1929, and it was partly rebuilt in 1953. The other ancient Mosque is located in the city of Yangzhou in Jiangsu Province, once the busiest city of trade and commerce during the Song Dynasty (960-1280). Xian-He Si (Mosque of Immortal Crane) is the oldest and largest in the city and was built in c.1275CE by Pu-ha-din, a Muslim preacher who was a sixteenth-generation descendant of the Prophet Muhammad. According to Chinese Muslim historians, Sad Ibn Abi Waqqas died in Guangzhou where he is believed to be buried. However Arab scholars differ, stating that Sad died and was buried in Medina amongst other Companions. One grave definitely exists, while the other is symbolic, God only knows whether it is in China or Medina. As one can see, the spread of Islam in China was indeed a peaceful one. The first envoy reached the southeast via the Zhu Jiang (The Pearl River) and was later followed by contact via an overland route from the northwest. Muslim communities are present over a wide geographical area in China today, including some in the remote places of Tibet, where I once met Tibetan Muslims in the middle of nowhere, while on a trek.